Tiffany SizemoreThompson runs the Juvenile Defender Law Clinic and the Education Law Clinic at Duquesne University. The clinics received a $25,000 Impact Giving Circle grant in 2017. Despite significant decreases since the 1990s, the U.S. still has the highest rate of youth confinement of any developed country in the world, with nearly one million youth involved in the court system per year. In 2016, about 3,300 young people were referred to the juvenile justice system in Allegheny County from local schools, law enforcement, juvenile probation and parents. At both local and national levels, youth of color are disproportionately represented in the juvenile justice system. In response to these high numbers impacting youth ages 12-24 in our region, the Foundation made its Qualitative Study of Youth and the Juvenile Justice System the first initiative of 100 Percent Pittsburgh. 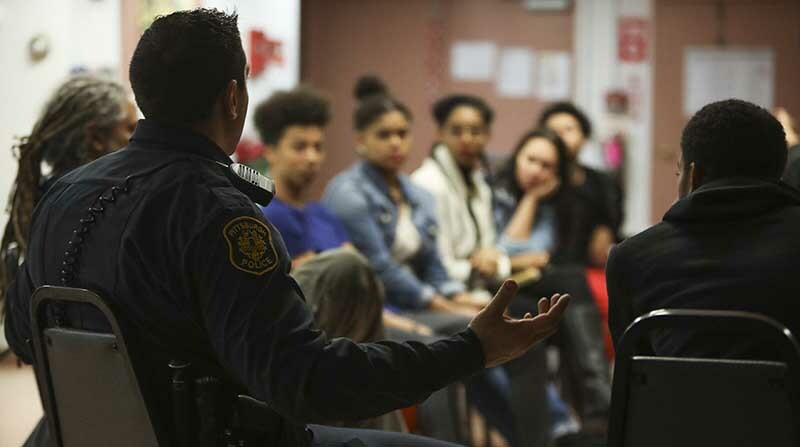 Pittsburgh Police Officers talk with Pittsburgh-area teenagers about how police and young people can maintain peace and mutual respect during their interactions. 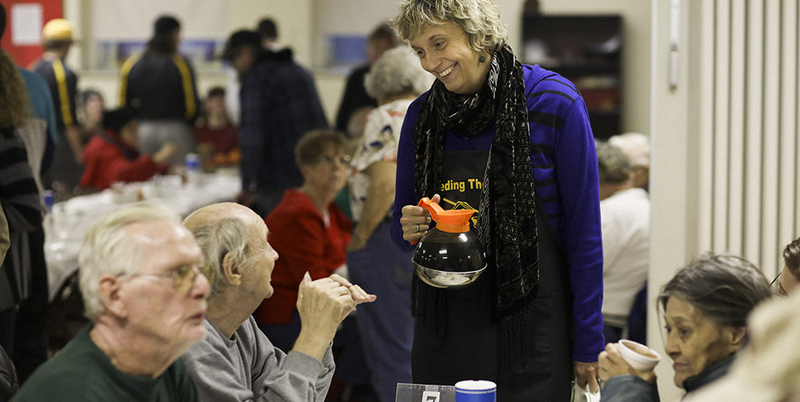 The discussion was organized by Beltzhoover-based Voices Against Violence, a Pittsburgh Foundation-funded nonprofit with the mission of reducing personal conflicts among members of underserved communities in South Pittsburgh. This eight-month qualitative study by The Pittsburgh Foundation, begun in fall of 2015 by the Foundation’s Program and Policy staff, found that youth involved with the Allegheny County juvenile justice system could play a much greater role in shaping prevention and system diversion opportunities. Youth participants emphasized the need to examine the circumstances behind referrals to the juvenile justice system in order to understand and effectively address the issues impacting their lives that are often out of their control. The report recommends addressing disproportionate involvement of of youth of color, particularly girls, and that youth be cultivated as advocates against system involvement by integrating their voice and vision as agents of change with human services staffs, law-enforcement authorities and with school officials to inform system-level prevention and intervention strategies. The Foundation's study also calls for schools to reform discipline policies and cultivate race-positive curriculum and advocates for changes to court-related fees and restitution policies, which can keep youth trapped in the system. This report reminds us that potential solutions for how to effectively support youth start with listening carefully to their voices, sharing their recommendations and committing to an agenda that puts the priorities of youth – not systems – at the center. The report seeks amplify the voices of youth by gathering first-person data from those who have experienced the juvenile justice system or are at risk of being involved with it in Allegheny County. Read the news release and link to the entire report, below. Voices for justice: Using first-hand stories of young people who have been directly affected by the juvenile justice system. 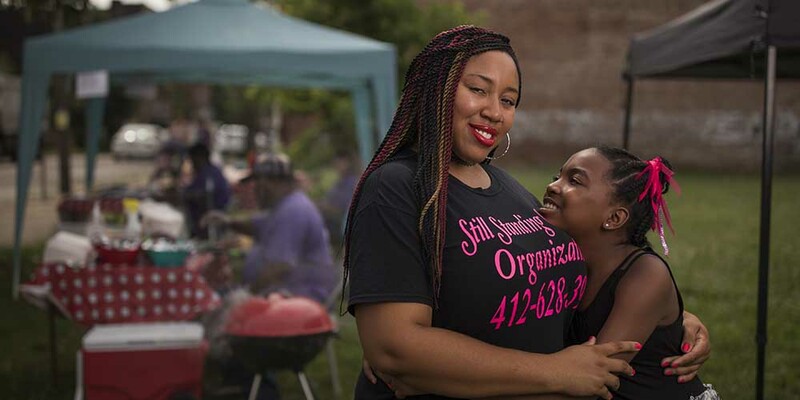 Out of the deep end: A Pittsburgh Foundation donor group funds lifelines to youth caught in the juvenile justice system. No money down: Bail reform seeks to cut incarceration rates. Foundation report calls for youth voices in juvenile justice reform: Eight areas identified where youth and stakeholders can improve system. Path to delinquency: Juvenile offenders often experience harsh, sometimes horrific childhoods.